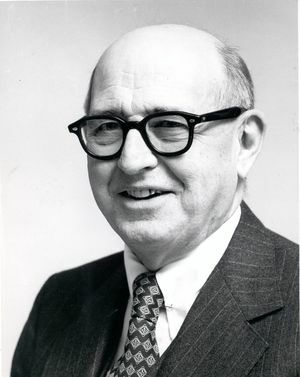 Donald G. Fink, IRE President, 1958, served as vice chairman of the National Television System Committee, and he later became the director of the Philco-Ford Scientific Laboratory. Donald G. Fink was born in Englewood, N.J. on 8 November 1911 and attended the public schools there. While in high school he developed two interests that were to shape his future career: he was licensed as a radio amateur in 1928 and served two years as editor of the school newspaper. In 1929 he entered the Massachusetts Institute of Technology to study electrical engineering. Two years later he studied the then new field of electronics under Professor Truman Gray, in the first college course so designated. Concurrently he was appointed editor of the M.I.T. undergraduate technical journal. In 1934 he joined the editorial staff of the magazine ELECTRONICS. There, under the tutelage of Orestes Caldwell and Keith Henney, he was encouraged to take a special interest in the then emerging field of television. By 1940 he was ready to publish Principles of Television Engineering one of the first textbooks in the field. In 1941 Mr. Fink took leave of absence from his editorial duties and joined the staff of the M.I. T. Radiation Laboratory. There he produced another book Microwave Radar and in 1943 became the head of the Loran Division of the Laboratory. He then transferred to the Office of the Secretary of War, serving as Expert Consultant. He took an active part in siting Loran navigation stations from Africa to Australia, traveling more than 80,000 miles. Following the war, he was awarded the Medal of Freedom and the Presidential Certificate of Merit for his overseas service. Returning to ELECTRONICS, Mr. Fink was appointed Editor-in-Chief of that journal in 1946, a position he held until 1952. During this period he became actively involved in the development of color television. In 1948 he was Chairman of the IRE Television System Committee. When the National Television System Committee was reconvened in 1950 to develop standards for color television, he was appointed one of its Panel Chairmen, and served as NTSC Vice Chairman in 1951 and 1952. He served as editor of its permanent record, the book Color Television Standards. In 1971 he received a special citation from the International Television Symposium in Montreux for his pioneering work in that field. In 1952, Don Fink joined the staff of Philco Corporation as manager of research projects in consumer electronics. Later he became successively Director of Research, General Manager of the Research Division and Vice President-Research, and in 1961 Director of the Philco-Ford Scientific Laboratory. In 1957 he published the Television Engineering Handbook and in 1960 Physics of Television, the latter later appearing in 15 foreign editions. In 1956 and 1957, he was editor of the Proceedings of the IRE. In 1958 he was elected President of the Institute of Radio Engineers. During his term as President, he was instrumental in setting up the first joint technical committee between IRE and AlEE, in the field of standards. 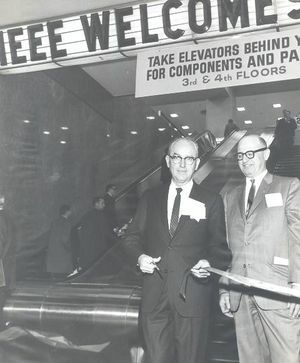 In 1962, Mr. Fink was selected to be the first General Manager of IEEE, an office he assumed when the merger became effective in January 1963. Later he assumed the additional title of Executive Director. At his retirement in 1974, the IEEE Board of Directors appointed him Director Emeritus for life. Mr. Fink was awarded the 1977 IEEE Founders Medal "For contributions and leadership in television, radar and technical journalism and service to the electrical and electronics engineering profession. " In retirement, Don Fink kept active in technical work as editor-in-chief of two million-word handbooks that together cover the fields of IEEE: The Standard Handbook for Electrical Engineers and The Electronics Engineers' Handbook. And, over the course of his life, amassed over fifty years on the air as an amateur radio enthusiast. Don Fink's wife, the former Sally Berry, was computing Fourier transforms at the Underwater Sound Laboratory in New London when they met in 1947. She took an active part in the women's activities of IRE and IEEE after the couple married 1948. The couple had three children. Mr. Fink passed away on 3 May 1996. This page was last edited on 23 July 2018, at 14:36.